HOUSTON (KTRK) -- There are plenty of ways to stay busy and keep cool this summer that won't cost you a dime. Apple Camp is a place where kids ages 8 to 12 bring their imaginations to life. They'll learn to make movies by storyboarding ideas, shooting video, and creating an original soundtrack. Or, starting this summer, campers can create interactive books complete with their own illustrations and sound effects. Registration for 2015 is not yet open, but you can enter your email address to be notified when they start accepting applications. Spots will fill quickly! If you have a student that just finished first grade through Algebra 2, you can sign them up for the free summer math program at TenMarks. Sign up for the program that will help your kids fill the gap while on summer vacation. Kids can earn a free book through the Barnes and Noble Summer Reading Program. Kids must read any eight books and record them in the Reading Journal. Just bring in the completed journal into the store and choose a free book to take home! The Scholastic Summer Reading Challenge is a free online reading program for children. From now until Sept. 4, kids can log on and enter their minutes to unlock stories and earn rewards. At the end of the summer, the schools with the most minutes read will win a visit from authors Michael Northrop (top elementary school), and Varian Johnson (top middle school). Head to Pottery Barn Kids every Tuesday from 11 to 11:30 a.m. for a free weekly story time. After kids attend five times, they'll earn a special gift. If you're looking for a great way to reward your kids, choose a calendar from the Chuck E. Cheese's website that will help your child work on good behavior. Once they've completed their calendar, they can take it to Chuck E. Cheese's and redeem it for 10 free tokens. Register your kids online and they'll be able to bowl two free games every day this summer. The deal is valued at over $500 and is available at several Houston-area bowling alleys. From now until Sept. 7 kids can bowl three games every day at several area bowling alleys for one low price of $20-$25 depending on location. Adults can get in on the action for just a few dollars more. Register online for the Summer Games pass and it entitles you to play Monday through Friday from open until 8 p.m. and Saturdays and Sundays from open until 4 p.m.
Read 15 minutes a day for a month in June and July. (Grown-ups may read aloud to kids who are still learning.) Use the online reading log to add up your minutes and have your parent or guardian initial each week. Once you've reached 300 minutes, bring your log to your local HPB to claim your Bookworm Bucks. 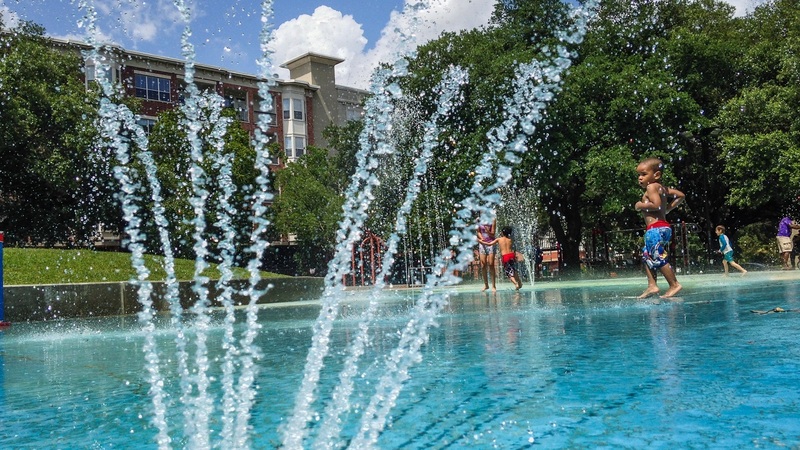 School is out for the summer, and what better way to cool off than a splash pad? For more free summer activities for kids, visit the BigKidSmallCity blog.